Arlene accompanied him to Poland for the three weeks. Rose was active in the St. Judes ladies aid and was in charge of many a fowl supper. She was a member of the local Erickson Women's Institute and helped her husband with field work. She was known for her hospitality and she loved cooking. Their home was open many times to local dances and parties. They were both active members of the Roman Catholic church and donated generously to several others. After celebrating their 40th wedding anniversary, in October 1959, Rose accidently passed away Jan. 5, 1960, on No. I highway near Gull Lake, Saskatchewan. Mike continued to live on the original farm with his son, Rudy, and family until July, 1981, when he went to the Sandy Lake nursing home. He passed away June 9, 1982. Rose and Mike raised three daughters and one son. One daughter Eva and two sons Stephan and twin Leonard passed away as infants. Mamie, who married Peter Slobodian, (refer to Slobodian, Peter and Mamie) lives in Erickson. They have three sons Calvin, Leonard and Brian. Florence married Chris Falasconi and lives in Calgary. They have two adopted children Richard and Rosalyn. Leona married Pat Lowe, lives in Lethbridge, Alberta and have twins Michael and Lisa. Rudy married Marion Shwaluk and lives on the original farm at Erickson with their seven daughters and one son. Rudy was born in 1932 on the farm home south of Erickson. He attended Westmount school and Erickson high school. He taught school at Whirlpool for one year (1949-50). He farms grain and beef on his farm. He has always been active in farm organizations, was local president 1952-53, director of district three sitting on the provincial board from '52-56 and Vice-President '56-58 of the Manitoba Farmers' Union. He was elected President of M.F.U. from '59-62. He was Vice-President of the National Farmers Union '61-63. He has attended over 40 delegations to Ottawa and has spoken at over 1500 meetings in Manitoba. He was a director in Manitoba Dairy and Poultry for ten years '56-66 and also a Manitoba Pool delegate for a number of years. He is presently Chairman of the Manitoba Beef Commission, Chairman of the Erickson Skating Rink Building committee and Big Game Chairman (deer, elk, moose and bear) for Manitoba for the Manitoba Wildlife Federation. He married Marion Shwaluk, a schoolteacher, from Oak burn in 1956. She taught three more years at Hilltop after moving to Erickson. Marion enjoys curling, helps with 4-H, and is a member of the W.1. and St. Judes Ladies. They have seven daughters and one son. Arlene born 1962, graduated as an R.N. from St. Boniface Hospital and is presently working at Swan River Hospital. She is engaged to Robb Griffiths from Crawford Park and plans to get married in July '83. Gloria, born 1963, is taking Agriculture at Brandon University. Judy born 1964, is taking Secretarial ad­ ministration at Red River College in Wpg. Louise (1966), Maureen (1967), Michael (1969), Roxanne (1970), and Sharon (1972) are all attending school in Erickson. Their children are all active in 4-H and participate in sports and community activities. Sharon, Gloria, Michael, Louise, Roxanne. Percy Gerald was born on July 26, 1896, in the County of Worchestershire, England. In June 1915, he enlisted in the British Army during the First World War, serving in Egypt and Palestine, returning home in 1919. In January 1922, Percy married Frances May Alford, born in 1898, at Stockton, Worchestershire, England. They immigrated to Canada, settling at Basswood, Manitoba, for a short while and then filed under the Soldiers' Settlement Act for W. 1/2 16-18-19W in the Rackham area of the Rural Municipality of Harrison. In June, 1940, Percy joined the Canadian Army in the Second World War and was discharged in April, 1941, for medical reasons. He was then employed as a Grain Buyer. During the years from 1941 to 1953, he was the Postmaster at Rackham and then worked at the Erickson Post Office until his retirement in 1957. Percy and Frances resided in Minnedosa until 1973 when they moved to the Parkland Home, Erickson. Frances served in the R.A.F. during the First World War. She was active in the work of the Canadian Legion and Auxilary. Frances passed away September 12, 1976, and was buried in the Erickson Cemetery. Percy, a resident of Parkland Home, enjoys fairly good health except for failing eyesight. Thomas William was killed in action while serving in I taly during the Second W orId War. 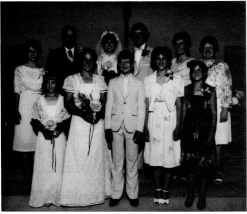 Violet married Ralph Gosbee and they had four children; Ethelmae Ellen Johnson, Carl Partaker, Thomas Cecil Partaker and Sharon Louise Chorneyko. Lillian married Nick Zatylny and they have two daughters; Diane Rayfield and Denise Haywood. Lillian now resides in Alberta.